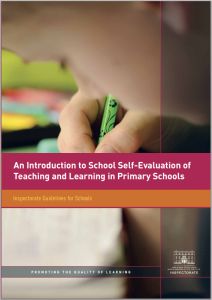 School self evaluation is a process involving an internal review of the school by the Principal, Deputy Principal, and staff, in consultation with the Board of Management, parents and pupils. This school year, we will looking at what we do and how we do it and will try to find ways in which we can improve what we do, taking into account opinions of the people who are involved in the life of the school. Even though we have a better than the national average level of literacy and numeracy in the school, there are always ways in which this can be improved. Likewise with all the curriculum subjects. We will be carrying out this process to meet the needs of pupils, parents and staff in delivering the highest possible education to the children in our school . When has it been done? The foci of of school improvement plan for literacy are spelling, handwriting and speaking and listening. The foci of of school improvement plan for numeracy are maths facts (tables), maths language and problem solving.